Figure 1.2, “A Three-Tier Load Balancer Add-On Configuration” shows a typical three-tier Load Balancer Add-On topology. In this example, the active LVS router routes the requests from the Internet to the pool of real servers. 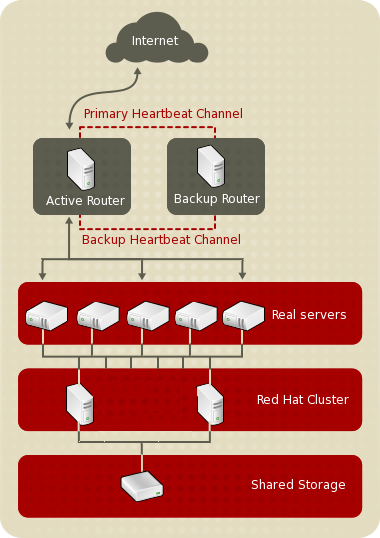 Each of the real servers then accesses a shared data source over the network. This configuration is ideal for busy FTP servers, where accessible data is stored on a central, highly available server and accessed by each real server by means of an exported NFS directory or Samba share. This topology is also recommended for websites that access a central, highly available database for transactions. Additionally, using an active-active configuration with the Load Balancer Add-on, administrators can configure one high-availability cluster to serve both of these roles simultaneously. The third tier in the above example does not have to use the Load Balancer Add-on, but failing to use a highly available solution would introduce a critical single point of failure.